"Binary" (as opposed to "text") file formats are not categorized separately. For file formats in general, see Electronic File Formats. For uncategorized binary formats, see Miscellaneous File Formats. For elements of binary formats, see Elements of File Formats. For the binary numbering system, see Base2. 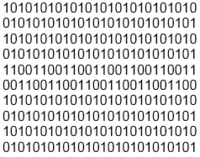 This disambiguation page lists articles associated with the term "Binary Data". This page was last modified on 9 October 2016, at 13:49. This page has been accessed 15,620 times.